At the end of the War there was considerable discussion about how the sacrifice of those who had fallen while serving with the Regiment should be commemorated. The lead in these talks was taken by Colonel Lord Henry Scott, the fourth son of the sixth Duke of Buccleuch, and Honorary Colonel of 3RS. He suggested that any Memorial should take the form of something more useful than just a Monument. In particular it should exist to honour the fallen while maintaining the comradeship that had bound them and their comrades of all ranks together as they shared the horrors of war, wherever they served. At a meeting in Edinburgh on 11 March 1919, attended by representatives, from across the ranks of the RS active wartime battalions, it was agreed that the Memorial should take the form of an ’all ranks’ Club to be situated in the heart of Edinburgh. Looking back from today it is difficult to appreciate the significance of such a proposal, almost a social experiment, which, in spite of the considerable advance of egalitarianism as a result of the War, ignored the much more rigid class structure that still existed at that time. The fact that the proposal came from the son of one of Scotland’s premier Dukes probably helped! The aims of the Club were to provide a tribute to those who had fallen in the Great War; to act as a rallying place for all Royal Scots past, present and future; and as a centre from which all schemes for the benefit of The Royal Scots (The Royal Regiment) can be worked. Fund raising started immediately and, as a temporary home, a large hut, and its contents, standing in St Andrew’s Square and which had been the American YMCA, was purchased, and opened for all Royal Scots in the autumn of 1919. The search for a permanent and substantial home continued and, in November 1920, Nos 30 and 31 Abercromby Place, in the heart of the Edinburgh New Town, were purchased at the very reasonable price of £5,460 19s 6d (£5,460.98 today). After extensive renovations and alterations, the new premises were occupied on 27 February 1922 before being officially opened by HRH The Princess Mary, Colonel-in-Chief of the Regiment, on 10 August 1922. At that time, apart from normal club facilities covering bars, sitting areas, library, dining room and kitchen etc, there were also ten bedrooms, two, later three, billiard rooms and a theatre area where reunions and concerts could be held. In 1929 the Club was extended with the purchase of No 29 adding a further eleven bedrooms as well as other facilities. The Club has had its ups and downs over the years but, following a major refurbishment in recent years, it is now a thoroughly modern Club offering 25 bedrooms and excellent facilities for guests, social events and business meetings. Membership has been broadened and reciprocal arrangements exist with over 230 similar Clubs both within the United Kingdom and right across the world. The Royal Scots Club remains, however, first and foremost, a living Memorial to those Royal Scots who made the supreme sacrifice for their Sovereign and Country since 1914. For further information see “A History of The Royal Scots Club (War Memorial)” written by Duncan McDougall, published in 1999. This is presently sold out but a reprint is being considered. 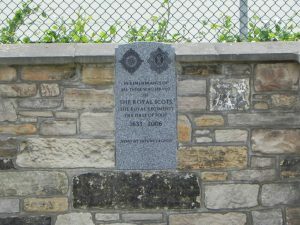 A rather more conventional Memorial exists in the form of the Memorial Gates erected at the then entrance to former Regimental Depot at Glencorse Barracks, Penicuik, some ten miles to the south of Edinburgh. 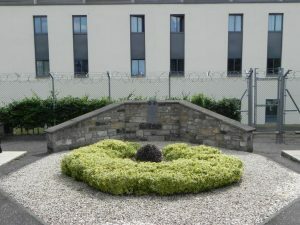 The Memorial combines traditional Scottish stone-work, with materials from Craigleith and Craigmillar quarries in Edinburgh, Caithness slate roofing and wrought iron gates bearing, in bronze, an enlarged reproduction of the cap badge worn in 1878. The Memorial bears the following inscription: ‘To the Glorious Memory of those Royal Scots who faithful unto death gave their Lives for King and Country in the Great War 1914-1918’. When opening the Memorial on 18 March1927, HRH The Princess Mary had this message for the Regiment. May all who pass in on their career learn how best to devote themselves to the service of their country and remember the deeds done in the Great War by those Royal Scots whose fame is commemorated by these Gates. Glencorse ceased to be the Regimental Depot in 1959 when, over three years, it was rebuilt to become first, in 1963, the Depot of The Lowland Brigade, then of The Scottish Division and, later, The Scottish and King’s Divisions. It closed again in 2004 and went through a major rebuild to convert it into a modern barracks, now the home of The Royal Highland Fusiliers, 2 Bn The Royal Regiment of Scotland. The entrance to the barracks has been moved some 150m along the road to the west. The Memorial Gates are now permanently closed and the area just inside them has been turned into a memorial garden for all those who served in The Royal Scots (The Royal Regiment) The First of Foot from 1633 -2006. Every year at 11.00am on the 11 November members of the Regimental Association parade at the gates to remember those who have gone before them with a short Act of Remembrance and the laying of a wreath. By arrangement through the Museum Office (contact details can be found at the end of the WW1 page), the ashes of former Royal Scots, and only former Royal Scots, can be scattered in the planted area of the memorial garden and/or memorial plaques may be placed on the memorial board. Plaques can only be displayed for those who have died since 28 March 2006, or 1 January 1946 if death was in Service. Plaques must conform to a standard pattern, details of which will be supplied by the Museum office. Armed Forces Day change of date. The Royal Scots Need You! The Royal Scots Regimental Trust is a charitable body registered in Scotland, with registration number SC008001.